Friday, 26 August 2016 marks the 7th year of Wear It Purple Day. Founded in 2010 by two Australian teenagers, Wear It Purple Day is a student-run, not-for-profit organisation which supports and raises awareness of young people who identify as sexuality and/or gender diverse (often referred to as 'rainbow'). Wear It Purple Day is now celebrated world-wide - 2015's Wear It Purple Day saw 193 schools, 29 tertiary institutions and 121 workplaces register to celebrate this significant human rights initiative. 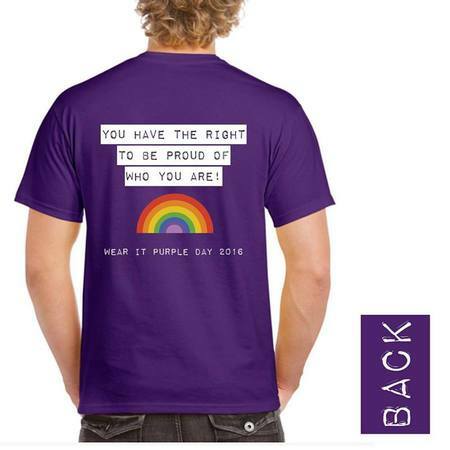 Wear It Purple's motto is simple yet powerful: 'you have the right to be proud of who you are'. Wear It Purple Day aims 'to help create a world that is safe for all young people, within which they are free to learn, grow and belong. Wear it Purple believes that everyone has the right to be proud of who they are and we aim to empower these young people to be able to'. To register your own Wear It Purple Day event, go to www.wearitpurple.org. Registration is free and easy - you will be provided with access to exclusive Wear it Purple Day online resources including printable posters; event planning tips and tools. School registrations will receive school packs including Wear It Purple wristbands.